"This makes a very nice side dish to your holiday feast, and I can't think of a main course, especially one made from some type of succulent animal, that this wouldn't pair wonderfully with." Fill a large pot with water and bring to a rolling boil over high heat. Place Brussels sprouts in water and cook for 2 minutes. Remove sprouts from water and transfer to ice water to cool. Drain and pat dry. Set aside. Place onions in boiling water; cook until nearly tender, about 10 minutes. Remove from water, rinse with cold water, and pat dry. Set aside. Melt butter in an ovenproof skillet over medium heat. 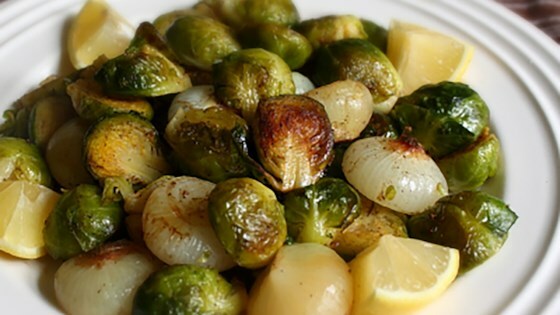 Stir in Brussels sprouts and onions; toss with butter to coat. Stir in salt and black pepper; cook for 2 minutes. Transfer skillet to the preheated oven and roast until golden and tender, 15 to 20 minutes. Garnish with lemon wedges and serve. Like the recipe but too many steps. No need to skillet saute. Boil them then coat with butter then roast in oven. The oven will do the browning. I'm a big fan of Brussels sprouts when I eat out so I wanted to see if I could create the same taste and texture at home. As usual, chef john's version didn't disappoint -- easy and delicious. Absolutely loved it. I just left em in the oven longer because I like the taste of it when they're more browned. Will make again! Wow. That's all I can say. If you don't like brussels sprouts, you'll like these- no kidding. :) Wow. Only 3 out of 9 at our picnic that like Brussel sprouts, but all 3 of us agree this is the best we ever ate. Made them exactly as the recipe. Can't wait to buy more fresh Brussel sprouts.